From the outside, the Parkway Theatre doesn’t look like much. Some of the upper windows are broken and a pull-down metal sheet covers the front door. Pigeons peck aimlessly on the sidewalk, and random bits of trash blow past. 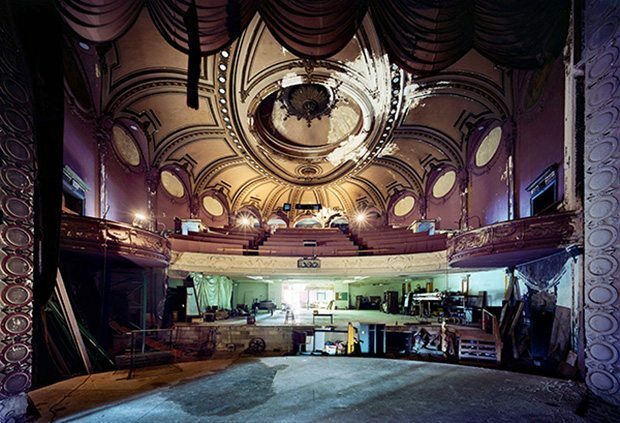 Located in a Baltimore neighborhood that is trying hard to redefine itself, this historic building is a shell of its former glory days as a bustling entertainment center. Enter the Krieger School’s Film and Media Studies program. And the Peabody Institute. And the Maryland Institute College of Art. And the Maryland Film Festival. Together they have formed a unique partnership that plans to transform the Parkway—and a nearby building at 10 E. North Avenue—into a vibrant headquarters for advanced film studies, filmmaking, film screening, and creative entrepreneurship. The Parkway Theatre opened in 1915 as a vaudeville performance house with about 1,200 seats. It was modeled after the West End Theatre in London and had an ornate Louis XIV interior with elaborate plaster work and painting. Today, one can see remnants of its former beauty in architectural flourishes and chipped murals. The neighborhood—about a mile south of the Homewood campus—is called Station North, an arts and entertainment district created in 2002 that spans about 20 blocks and benefits from city and state tax breaks and other incentives to promote arts-related development and improve quality of life. The ongoing revitalization of Station North involves several arts and housing projects, and the Parkway and 10 E. North Avenue will be the centerpieces. The plan is for the old Parkway Theatre to be renovated and restored to house a 420-seat film and live performance space. Two smaller theaters, private screening rooms, seminar rooms, and a restaurant will be added. It will be used by the Maryland Film Festival, the Krieger School’s Film and Media Studies students, and MICA students. Across the street, 10 E. North Avenue will become a film center, shared by the Krieger School and the film program at MICA. Students will take classes and create and edit films at the 10 E. North Avenue location and screen their films and host film series at the Parkway. Linda DeLibero has directed Hopkins’ Film and Media Studies program since its inception more than a dozen years ago. She says the program’s expansion to Station North and its growing partnership with MICA and the film festival will open up new opportunities for students. According to Andy Frank, adviser to Johns Hopkins President Ronald J. Daniels on economic development, the film center at 10 E. North Avenue will be completed first—around the end of 2015—and the Parkway will be completed in late 2016. Frank points out that the Station North efforts are in concert with the goals of the Homewood Community Partnership Initiative, a collaborative effort between the university and the 10 neighborhoods and one commercial district that surround the Homewood campus. The aim of the initiative is to create and support strategies that strengthen neighborhoods such as Station North.